Learn to make your own fresh furikake at home! Furikake, a Japanese rice seasoning, is a delicious way to dress up a simple meal. In this hands-on workshop, learn three different recipes for homemade furikake. We wll taste them with delicious rice at the end of class. Step up your tsukemono skills in this new workshop with Yoko. Put your pickling skills to the test! Learn about tsukemono, Japanese pickles in this intermediate workshop, with instructor Yoko Maeda Lamn and make three different types of tsukemono, including nukazuke, to take home. We will taste assorted tsukemono with delicious rice at the end of class. This is a Hands-on Miso Making Workshop. You will learn about rice koji (a key ingredient of Japanese traditional condiments) and about all different kind of miso, as well as how to make your own miso at home. Homemade miso is especially tasty and healthy and has many delicious kitchen applications. You can purchase Tokoname products at special price during this workshop. This is a Hands-on Miso Making Workshop. You will learn about rice koji (a key ingredient of Japanese traditional condiments) and about all different kind of miso, as well as how to make your own miso at home. 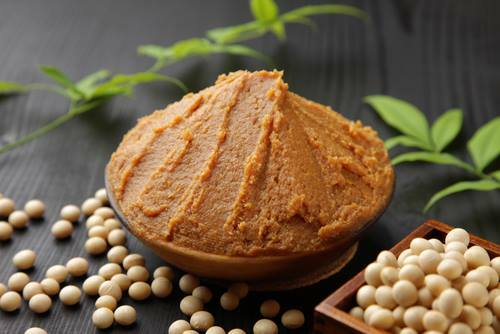 Homemade miso is especially tasty and healthy and has many delicious kitchen applications. The class includes how to make misodama (instant fresh miso soup) and take it home. In this workshop, you will learn how to make 4 different traditional types of pickle called nukazuke, which uses rice bran for fermentation, kasuzuke, which use sake lees for fermentation, kojizuke which made from amazake and salt + 1 more. You’ll be served a delicious ochazuke meal complete with 4+ extra tsukemono pickles. Of course, everything you make in this class can be taken home. It will be ready to eat within 10-14 days. We’ll teach you how to take care of them at your home! In this workshop, you will learn more about rice koji. Koji is the key ingredient not only for miso, but also for sake, mirin, soy sauce and other Japanese traditional foods. We will teach you how to make koji ingredients at home, discuss the history and benefits of koji, and also demonstrate how to cook Japanese home meal using koji ingredients. You will even get to make your own shiokoji (salt koji) and umami shoyukoji (soy sauce koji + secret) and take them to home! We will wrap up the class by tasting our finished products.